This is the follow-up to the January 16, 2010 post about things we like in Pasadena. As in the previous post, contact information is at the end of the post. 1. The Rose Bowl: In addition to the great sports that happen here, the stadium is the centerpiece of an appealing network of running and hiking trails. 2. 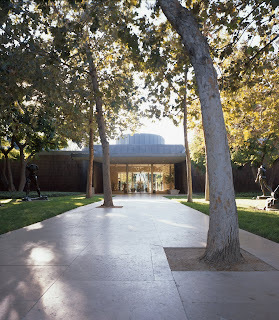 Norton Simon Art Museum: This gem of an art museum has a wonderful mix of Old Masters, Impressionist and modern art. 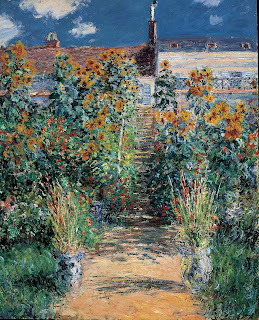 The collection includes Monet’s bright blue, sunflower-filled painting, The Artist’s Garden at Vetheuil, numerous Van Goghs and Picassos and Matisse’s Jazz. The sculpture garden is calming and attractive, a place to enjoy sculpture and rest in between looking at great paintings. 3. The Pasadena Casting Club: South of the Rose Bowl, the Club takes you back to the nineteenth and early twentieth centuries, when the Arroyo Seco was filled with trout, rather than a concrete lining. The Club, a leader in teaching fly fishing and helping conserve California fisheries, is planning to undertake a major renovation of the casting pond and clubhouse in the upcoming months. 4. The Courtyard of One Colorado: One Colorado, a super block filled with restaurants, office, shops and a theater, is on the north side of Old Pasadena. Shops and restaurants are appealing but my favorite part of One Colorado is the courtyard in the middle of it, a great place to rest while shopping or to hear music or see outdoor art exhibits. 5. Sabor y Cultura: This is the Pasadena branch of the famed Beverly Hills coffee house. It has a nice light menu, with many vegetarian choices and breakfast served all day. To be honest, I did not try the coffee, so you need to make up your mind about this. The place has entertainment and we were delighted on a recent visit with the jazz and American standards played by the group 6th Street Jazz. 5 1/2. The Holiday Inn Express and Courtyard by Marriott follow-up: We have been back to Pasadena since our January post and are happy to report both of these hotels remain at the top of their game with excellent service.